By Kori ~ August 2nd, 2012. Would you like a quick suggestion for a good wine to drink tonight (or this weekend) that wonâ€™t break your budget and is widely available? Many of our readers have said this is something they would like, so here is this weekâ€™s selection, the 2010 Saviah Cellars The Jack Syrah from the Columbia Valley of Washington State. Saviah Cellars is a family-owned winery located south of downtown Walla Walla, Washington, near the Oregon state line in the Walla Walla Valley AVA. Owner/winemaker Richard Funk and his wife Anita, both natives of Montana, moved to Walla Walla in 1991. Rich became acquainted with a number of the area wineries while working as an Environmental Health Specialist with the Walla Walla County Health Department. Through his work at the Health Department on water quality and wastewater issues, he got a firsthand look at the vineyards in the area and developed a relationship with a number of local winemakers who helped him get his start in the industry. Saviah Cellars was founded in 2000 and currently produces about 9,500 cases per year. The name Saviah is a family name from Anitaâ€™s great-grandmother. Saviah Cellars consistently produces high-quality wines. 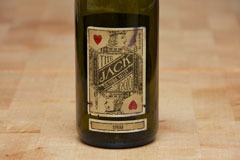 The Jack is a value line in the Saviah portfolio produced with declassified fruit. 2010 Saviah Cellars The Jack Syrah (Columbia Valley, Washington): 80% Syrah, 10% Grenache, and 10% Mourvedre. Deep, dark purplish red. Nice nose with aromas of plum, raspberry, and cinnamon. Juicy red cherry, raspberry, plum, and spice come through on the palate. Medium to full-bodied with lively acidity, medium to high tannins, and a very long finish. I can find the Saviah Cellars Jack Cabernet at K & L in my area….will pick up a bottle of the Syrah if I find it. Glad to hear K&L carries The Jack. Hope they have the Syrah. Let us know what you think of it. Cheers!